Thank you to All the Veterans who have Served our Country! There are many ways to celebrate Veterans Day to thank those who have served and remember those we have lost. 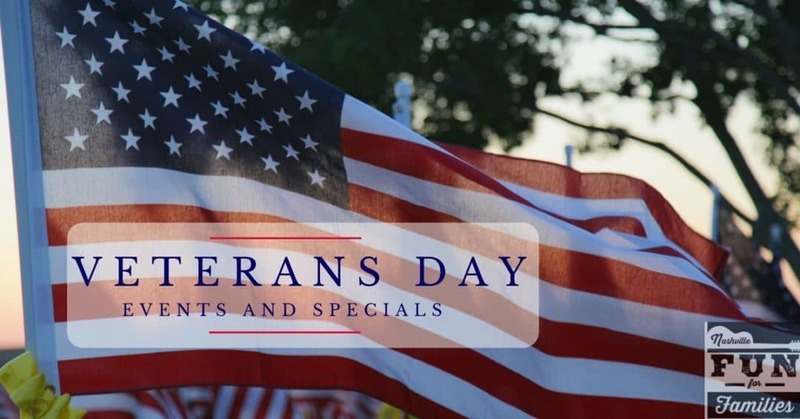 Attend one of the many area events and if you are a veteran, please take advantage of one of the many deals and discounts as a special thank you for your service. This year, Veterans Day falls on a Sunday, so there are some celebrations that are happening on Saturday, November 10th, as well as the weekend before Veterans Day. This parade will process through Pleasant View. Click here for updates and the parade route. Come out and celebrate Veterans from all conflicts with a parade in Hendersonville. The route will follow the traditional Hendersonville parade route, starting at Cherokee Rd. and move along Main to Stadium Dr. The parade begins at the Lebanon/Wilson County Library and continues to the Veterans Plaza on East Main Street. A celebration at the Veterans Plaza will follow at 11 AM. The Parade will begin at 10 a.m. at the corner of N. Eighth and College Streets, next to the Sundquist Science Building at Austin Peay State University, with the reviewing stand at the Third Street side of the courthouse. The parade will proceed from College left onto University Avenue, right onto Main Street, left onto 3rdStreet, left onto Commerce Street, left onto University Avenue, right onto Franklin Street, left onto 8th Street and back to the APSU parking area. Parade begins at 11 AM, The parade route begins on Oldham Drive, right on Dortch, right on Stonebrook, left onto Nolensville Road to Nolensville Park. The Honor March begins at Tennessee Legislative Plaza Downtown Nashville and arrives at the Wilson County Veterans Plaza and Museum in Lebanon, Tennessee at 5:00pm each year to celebrate the sacrifices made by Veterans and Military Families. At the conclusion of the march, we encourage everyone – Veterans, family, friends, and patriots to join us at the Wilson County Veterans Plaza and Museum to honor our Veterans and Military Families in a closing ceremony. Click here for more details. The parade will start from Calvin Short Football Field Parking lot and process to Gallatin High School Parking Lot. Be a part of the 100th anniversary event as we hold this year’s event at the site of the Captain Jeff Kuss USMC Memorial (Map). The Stewarts Creek High School Brass Choir will perform and there be a wreath-laying ceremony. Located on the Murfreesboro Square on the corner near the War Memorial Monument at the Rutherford County Courthouse. Click here for more details. Starting at 14th Avenue, the parade will process down Broadway to 3rd Avenue. Be sure to get there early to get a great seat! The Parade begins promptly at 11:00 a.m. at West Main and Fifth Avenue. Prior to the parade, a reception will be held at the Williamson County Archives from 9 a.m. until 11 a.m. for local veterans and their families. The parade route travels down Main Street, from Five Points to Second Avenue. Many area businesses, stores and restaurants are offering deals and discounts to Veterans to say thank you! If you have served, please be sure to take advantage of a discount or free meal this weekend! These are national deals, so be sure to call ahead to make sure your local restaurant or retailer is offering the discount. Applebee’s – Veterans and active duty military receive a free meal from a limited menu on November 11. Chop House – On November 11 and 12, veterans get 50% off any dine-in lunch or dinner entree. Logan’s Roadhouse – On November 11 between 3 and 6 pm, veterans and military personnel receive a free meal from the American Roadhouse Meals menu. Find even more restaurant deals on this giant list compiled by Military.com. Visit the World of Coca-Cola in Atlanta for free year round. Military Appreciation Week – In honor of the Veteran’s Day Holiday, all active & retired members of the US Military who visit between Nov. 8 – 12, 2018 may show their military ID to receive free admission to the museum. The Country Music Hall of Fame and Museum is excited to celebrate and honor all Active Duty and Retired Armed Services and immediate family members November 10-12 with a weekend full of patriotic programming and free admission (maximum of 4 free admissions per family), and a 10% discount at Circa, Museum Store, and Hatch Show Print Retail Store. The grounds of the Hermitage, will once again provide the beautiful setting for an inspiring display of one thousand U.S. flags as the Exchange Club of Donelson-Hermitage joins with the Hermitage Presidential Site to host their 3rd Annual Field of Honor® event. Building on two highly successful events, this year’s display of the Stars and Stripes honors veterans who through their service and sacrifice have given added meaning to the flag that they have carried in defense of our nation. The panorama of red, white and blue is hard to describe, but once experienced it is not to be forgotten. This is especially true as the flags fly on the beautiful grounds of Andrew Jackson’s stately home. There will be no charge to visit the Field of Honor® display, and all are invited to walk with us through the ordered rows of flags. This is an event not to be missed. Friday, November 9th at 2:00 P.M.
Monday, November 12th at 1:00 P.M. The Grassmere Historic Home will be open to visitors on this day. A collection of military items will be on display downstairs and on the back porch of the house. Visitors must show their military ID, veteran organization ID, discharge papers or other official military identification to be given free admission. Dependents must be accompanied by an active duty military personnel or veteran to receive the discounted admission. Please note: The normal parking fee per vehicle will still apply. This Veteran’s Day, and all-year-round, Topgolf offers the “Heroes Discount” for military (veterans and active duty), police, fire and EMS personnel with valid I.D. This includes 20% off monthly memberships and 10% off game play. To say thank you, the Adventure Park at Nashville is offering a free ticket to any U.S. Veteran or active member of the military to climb on Sunday, November 11, 2018. All that is required is for the military participant to present their military ID when arriving at the Park. Limit one ticket per military member, for use only on November 11, 2018. Find additional discounted admission deals for attractions all over the country HERE. Thanks sooo much for the support and I know for a fact that we all veterans appreciate the continued pat on the back. This might be the turning point of the year for a lot of us for the good. Thanks and GOD BLESS!!! !